I was spending the week between Christmas and the New Year in Michigan’s Keweenaw Peninsula. 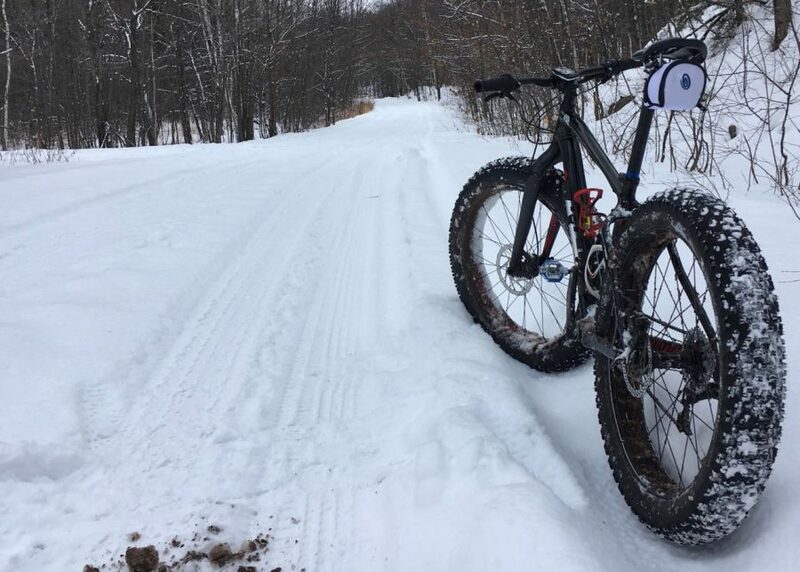 The main objective of the week was to spend time on the Keweenaw’s spectacular XC ski trails, most notably the Swedetown Trails in Calumet and the Michigan Tech Trails in Houghton. They are awesome ski trails and I’ll write up a seperate ski report about those trails, but I had burnt out my ski legs by the end of the week… So, I jumped in my truck and headed toward Marquette County my last day in the Keweenaw to wander around the Ishpeming Fat Bike Trails, where the 906 Polar Roll would be held in February. I thought it was a great opportunity to do a little recon, since I was within a couple hour drive. My hydration pack had a leak in it, so I ended up just tucking 1 water bottle in my back jersey pocket, which is my middle layer. Again, my intention was to only ride for a couple hours and I figured I would be thirsty when I finished, but the one water bottle would get me through. It was actually a CarboRocket mix in the water bottle, so I did have some fuel. I should have swung by a shop and picked up a second bottle. Anyways, I headed up the groomed trail under the pipe gate and started my exploration. The trail started with a gradual climb and continued working its way up hill. 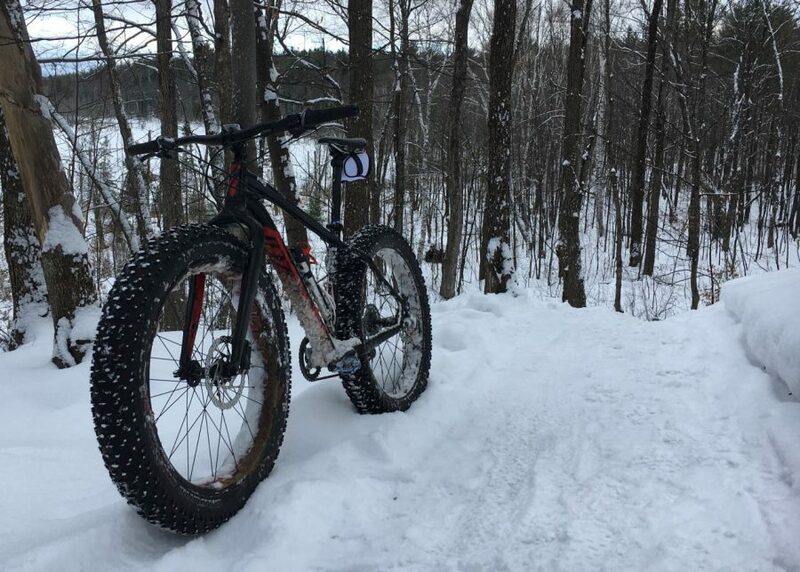 I was still running a 2 X 10 set up, but had broken my small ring up front on a short ride a few days earlier in the Keweenaw and was stuck with a 36 tooth front ring and an 11 – 36 cassette in the back. That being said, the climbing was manageable but did force me into some low cadences. The trail continued uphill for .7 miles and my first thoughts were that Polar Roll was going to be pretty awesome if we headed up Hill Street and hit these trails. 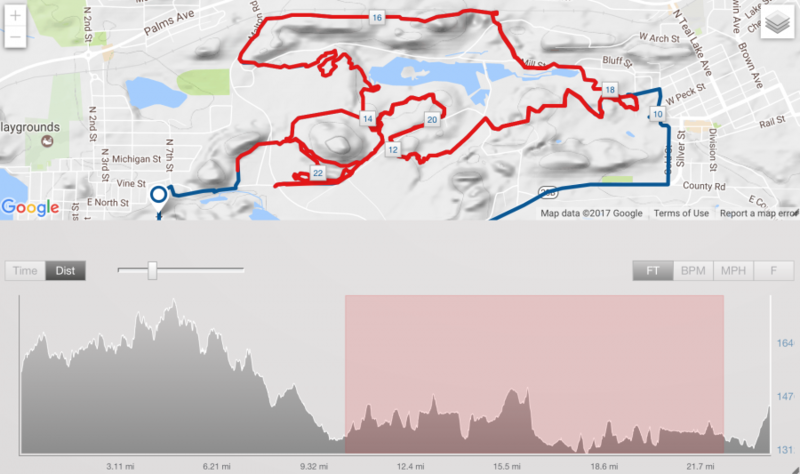 I didn’t know if that was the plan, but a role out from Ishpeming, up Jasper, Hill Street and then into these trails would sure thin out the crowd and make for some good hard racing. Lets face it… racing is much more exciting when climbing is involved. I hit some downhill sections, but the trail really never flattened out completely and was usually headed up or down. I hit one hill that I had to bail. There were foot marks from other folks bailing and I think that even if I had my small ring, I would have had to bail and walk as it was really steep and traction would probably be a problem, regardless of gear selection. Back on the bike… There was one spot that the trail went over an unfrozen creek, but it was solid to ride through and there really wasn’t much water flow. 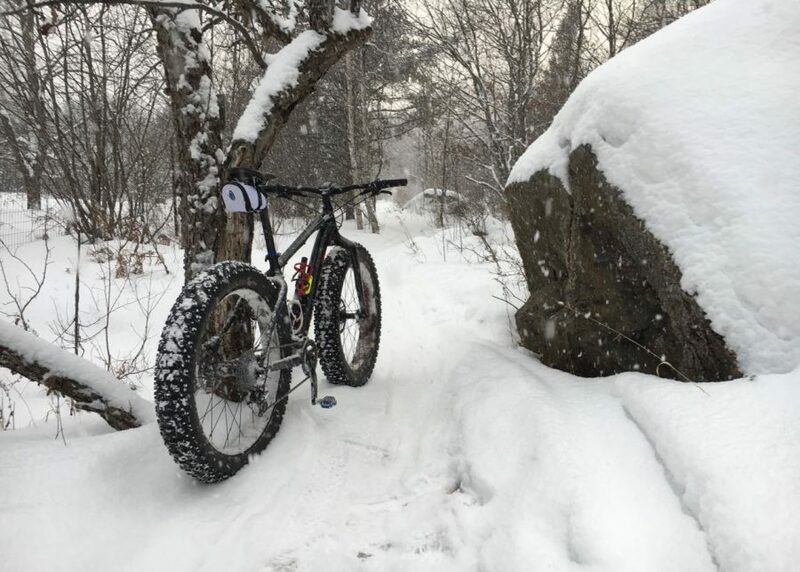 It was some great fat biking. Around 3 and a half miles, I came out to a rail trail or unmaintained road. I could see fat bike tire tracks going up and into the woods to the left, but I could also see where the snowmobile groomer went up to the right. I thought I saw the post on the RAMBA Facebook page to keep hanging right hand turns. I believe Hill Street trails are new, so they hadn’t been marked yet. Anyways, I headed up to the right and I do mean up as the trail went up hill. This is the loop with the “4” and the “6” in it in the map above. Those are mile marks of my ride. There had been a little bit of traffic from snow shoers or walkers that made the trail bumpy, but it was manageable. Eventually, the walking traffic had stopped and it was just me with a few inches of crunchy fresh snow on top of what was probably the first pass with a snowmobile groomer or in hind site may have just been the first snowmobile scouting of trail. At the end of the day, I didn’t actually know if this other loop that I was on, was actually part of the fat bike trail… If not, it should be! It was ridable, other than a few spots that I ran out of gears at the top of a climb. 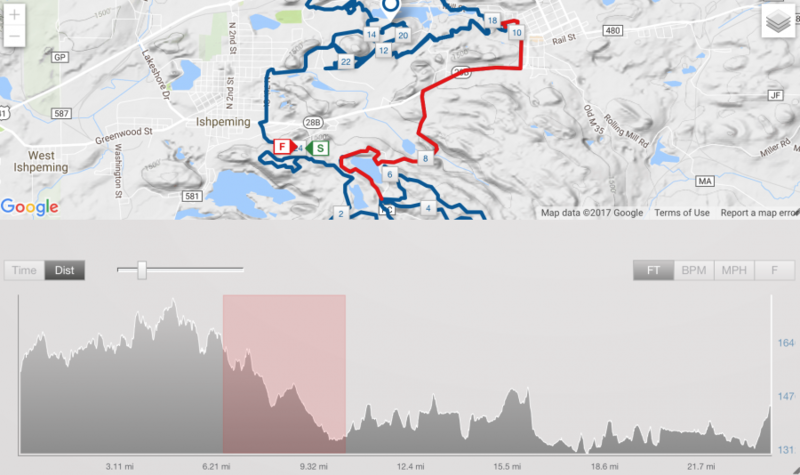 It ended up being an additional 3 mile loop, by the time I popped back out on that unmaintained road right near the intersection that I had entered the loop. It also worked me over good. I would say it is all ridable once groomed and packed a few more times and with a better gear ratio than my 36 X 36. As a side note, I have a 28 tooth direct mount on the way and am just gonna run a 1 X 10 set up with a 28 up front and 11 – 36 10 sp in the back. I think this will be sufficient for fat bike needs. The 28 tooth direct mount was really cheap and I don’t feel like spending the money for new shifters, derailer and cassette for just 1 more gear in the back. Rarely do I need to maintain anything over 20 mph and I think traction becomes a problem in the snow with anything that requires more gear ratio than a 28 X 36 anyways. I am sure there are some that disagree and I will let you know if I regret it. As I mentioned, I popped back out on the unmaintained road near where I entered this loop and decided to head up that trail that I originally saw going up the road and to the left. It looked like I was back on some more used trail section as it wrapped around the lake. It was great riding, but I was worried I would eventually dump back out on Hill Street and I was wanting to make my way over to the SBT loop. I had an assumption in my head that I would run into a trail to cross cut over and connect to the SBT Loop. Again, I am not familiar with these trails, but I was making some assumption that this would probably be part of the Polar Roll and they would have to connect us somehow. Anyways, I came to a fork in the trail and I took a right. There was a fresh snowmobile track on it that I followed and continued wrapping around the other side of the lake. Ironically, I popped out on a road that turned out to be the end of the maintained part, not very far from the unmainted part of the road that I had come out to twice before. I decided to just wander north on the road and eventually popped out on County Rd 28B. 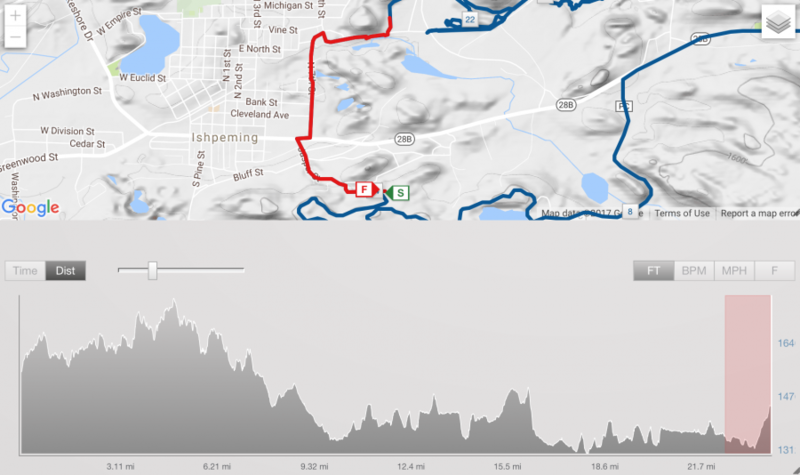 I pulled up Google Maps on my phone and realized I wasn’t too far from Negaunee and decided to ride the shoulder up to Negaunee and catch the SBT Trail Loop there. 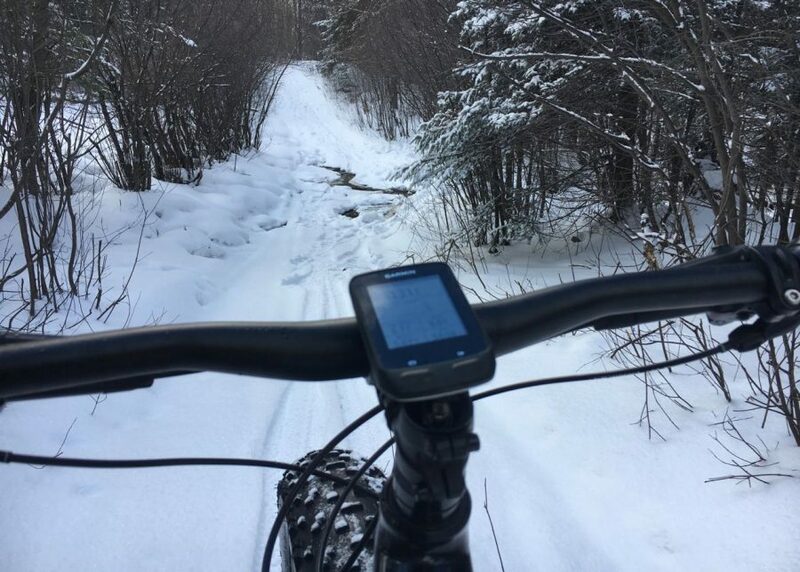 I found the SBT trail loop and quickly found myself at the staircase that we had to ride up during the Marji Gesick 100 in September… I didn’t figure I would make it in the snow, but I did! Anyways, the trail riding was really good. There were a few offshoots into less maintained trail, but I stayed on the nicely groomed stuff. It was hilly, but all ridable and the hills were not too long. They definitely made you work, but didn’t hammer you. I eventually came out on some flatter straight section of trail and came up on a couple other guys stopping at an intersection. I asked them which way to go as I figured I would continue around the whole loop back through Negaunee and then just reride the section from Negaunee to Ishpeming and make my way back up to Hill Street vs back tracking from Negaunee. The guys continued heading up the flatter trail, while I headed into the inner trail section. They yelled out to me about meeting up at Cognition when I made it to Ishpeming. I believe one of them had mentioned that it was their first fat bike ride also. Anyways, I didn’t go to Cognition as I mentioned I was going to continue riding. Plus, I had to get back to the Keweenaw after my ride for New Year’s Eve with the family. I did hit one climb in this section that I had to bail near the top. The other guys I had run into had warned me of it. It was a little icey, but I think I would have cleared it with a little more gear ratio. I was also getting a little tired and wishing I had a second bottle with me at this point. Anyways, I came out on the north side of Ishpeming on Malton Road and then back into the trails again. This is where things became familiar again from the 906 Polar Roll last year. After looking back at my GPS file, I realized that quite a bit of the SBT Loop that I rode on this trip, was infact already part of the 906 Polar Roll from last year. I came across another climb along a fence line that challenged my fatigue with my 36 X 36 rings, but I made it. I came out on some more open 2 track type trail and wasn’t sure if I was still on the SBT Loop and turned around and went back to the last sign. I was on the right path and kept going. Just before Negaunee, I dropped down a big flight of stairs that was pretty cool. There was, what looked like a wedding party there taking pictures and they shouted out at me with a few cheers as I dropped down the stair case. That was fun! I was back where I started in Negaunee now and started making my way back to Ishpeming. I was really tired now. I probably should have stopped and found a place to refill in Negaunee. Regardless, I kept riding and then came up on a partridge that came across the trail right in front of me, landing on a log near the trail. It wasn’t bothered by me at all. I stopped and watched it for a few minutes. I eventually came back to that intersection where I had met up with the guys on the first lap. I decided to go straight this time, thinking it might be a faster way back to Ishpeming. I came across one more intersection, but continued going straight again… The trail became a little rough and I eventually dumped out on the road, but it appeared that my only option was to ride up some snowmobile path or the road, so I turned around and headed back to the previous intersection. This trail had some walking traffic on it and was a little rough, but I eventually dumped out on some good trail again and found the sign that pointed toward the Cognition Trailhead and I followed that direction. The trail was groomed great and soon I was out on a side street in Ishpeming. The signs pointed toward the snowmobile trail to head back into town, but I stayed on the side streets. I pulled up Google Maps on my phone to see where I was and then headed south. I would hit 28 and then find Jasper. 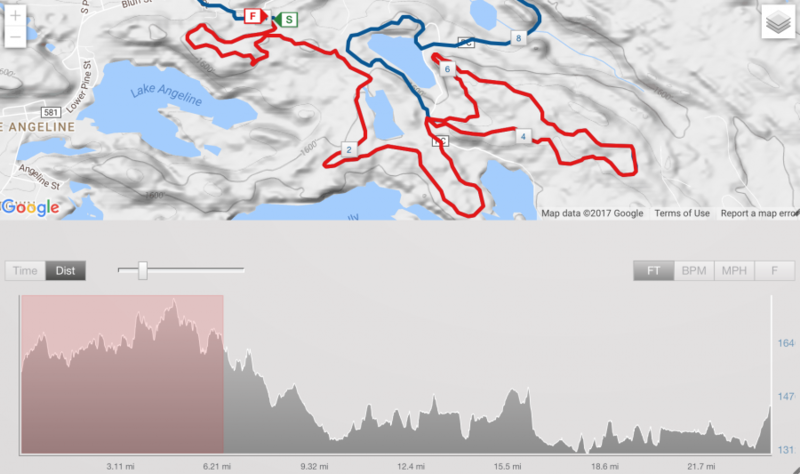 I started climbing Jasper to Hill Street and then saw what was the trail entrance to the climb up to the top of Jasper and the final checkpoint of the Marji Gesick 100… I was very worn out at this point of my fat bike ride, since I only took 1 bottle of water and had been out for 4 hours. I was thinking here we go again… Marji Gesick is haunting me. I still had to make it up Hill Street to my truck and layed into my pedals as my mental way of already preparing for the 2017 Marji Gesick and overcoming my fatigue with mental strength to make it to the finish line. I made it to the top of Hill Street! Probably no big deal to anyone reading this and it might be one of those “had to be there moments”, but it was a little win for me to finish off the ride for the day. 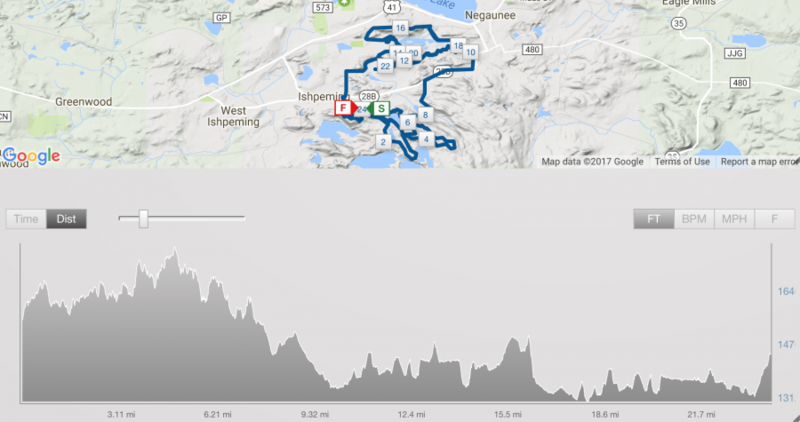 The Polar Roll course hasn’t been released yet, but since we start and finish all in Ishpeming, I have to assume much of what I rode will be part of the race. If so, it’s going to be a really sweet race! I just don’t know how it is all connects… I guess I will find out on race day. 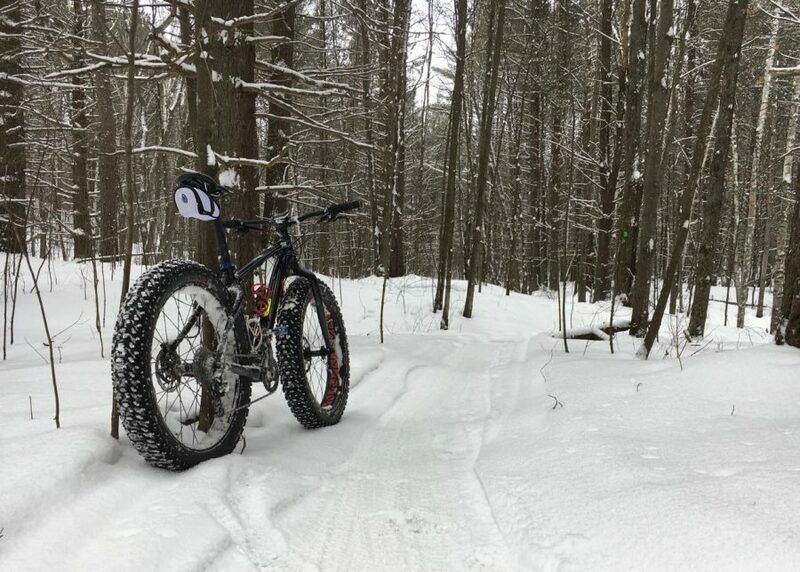 Bottom line… Big props to RAMBA and Ishpeming for laying out some nice groomed singletrack for fat bike riding. I am looking forward to coming back for the Polar Roll. I didn’t have time to stop at Cognition Brewery, but I did pick up a Pasty from Lawry’s Pasty shop to eat on my drive back to the Keweenaw that hit the spot. Look for my Polar Roll Race Report later in February.